Jinshan (Gold Hill) Pagoda, standing 3 kilometers northwest of Zhenjiang on the southern bank of the Yangtze River, was originally built during the Eastern Jin Dynasty (317-420) on the slope of the mountain Jinshan. 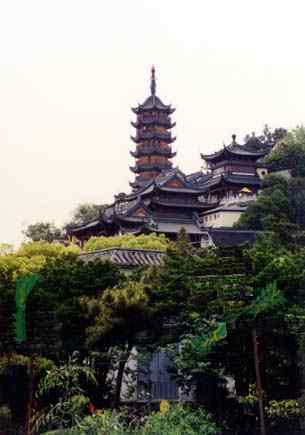 On top of the mountain is the Cisi Pagoda and Liuyun Pavilion . There is a legend about this pagoda. A white snake turned into a girl and married a young scholar named Xu Xian. Abbot Fa Hai tried again and again to undermine their marriage. Out of indignation, the white snake summoned a deluge and flooded Gold Hill Pagoda.